Getting there: As this is a cul-de-sac, there is only one way to get there, which is from the north. It can be approached from Worcester as follows: Drive south-west on Durban Street (R43) out of Worcester for 5 km to cross the Breede River via the white bridge, where after you will arrive at a T-junction. Turn right and remain on the tar road for 7 km as the road skirts the Brandvlei Dam (which is mostly unseen). At the 7 km point there is a fork at GPS S33.688070 E19.364925. Turn left at this fork and follow this smaller tar road (DR 01386) for 5,3 km to arrive at the northern start of the pass. This road is also commonly known as the Louwshoek Voorsorg Road. For those wanting to approach from Cape Town, take the N1 north via Paarl and the DuToitskloof Pass. Turn right at the end of the Du Toitskloof Pass to Rawsonville at GPS S33.704564 E19.244464 onto the R101 and drive north-east for 6 km till you arrive at 4 way intersection at GPS S33.682903 E19.299580 where you must turn right towards Rawsonville. Drive for 1,3 km into Rawsonville, At the first stop street, turn right into Riebeeck Street and drive SSE through the town, being aware of the several partially obscured stop signs and speed bumps. At the end of the town you will cross a bridge which curves to the left over the Smallblaarrivier. Within 1 km the road crosses a second river, the Holsloot. Turn right immediately after the second bridge at GPS S33.693956 E19.326073. Drive south-east along this flat tar road for 4 km to arrive at a T-junction at GPS S33.724667 E19.346997 where you must turn right again. Drive along this tar road (DR 01386) for 1 km to arrive at the northern start of the pass. 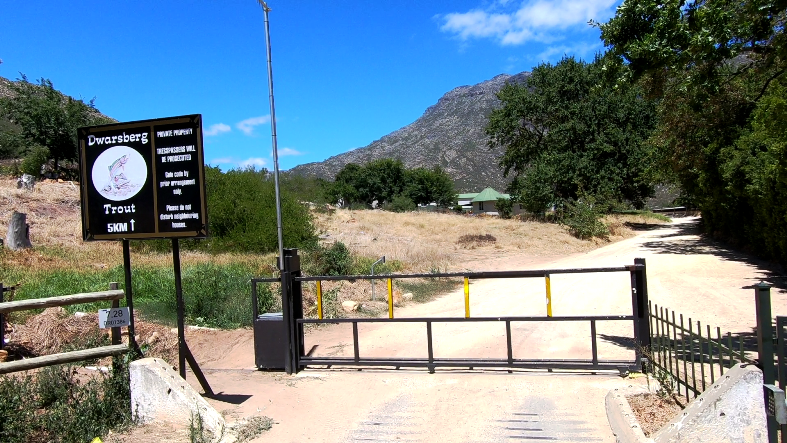 Pass Description: The first part of the pass is a very easy traverse through a number of wine and fruit farms which include Weltevrede, Louwshoek, Rooinekke and Alartskraal. 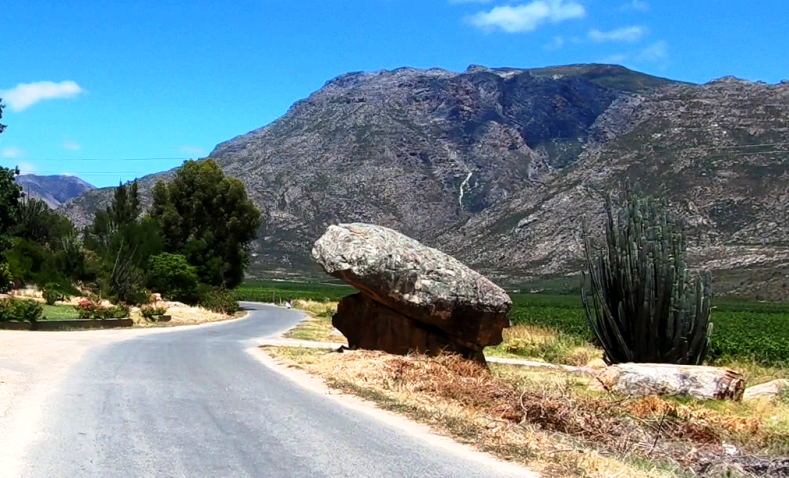 On the left the road is bordered by tall mountains and the right offers views of well-manicured vineyards and orchards stretching right across the substantial flood-plain of the Holslootrivier. Most of the first part of the pass traverses the original farm known as Horloge Krants. Another feature not to miss is a large rock - actually two rocks on top of each other - which appear close to the roadside on the right about 600m after the start. This rock has the comical name of Malkopklip (Mad Head Stone) and with a little imagination a number of monster images can be seen. You'll need to get out of your car if you want to get a view of the tallest peak in the area which is the 1800m high Brandvleiberg, with the actual peak bearing the name of Queen Victoria Peak. There are a number of lovely old Cape Dutch farmsteads and at the 1,4 km mark, on the left is an immaculately restored farmhouse with the year 1847 set into its gable. The setting is magnificent amongst rolling lawns and shady oak trees. This meander through the first set of farms sets the mood for the road ahead, but rest assured that this is the easiest part. Whilst driving through this active farming area be aware of children and pedestrians on or near the roadway. After 1,9 km you will arrive at the end of the tarred section which is also marked by a cattle grid and a steel sliding gate which requires a pass-code to gain entry. You have to pre-book either to picnic, camp, rent a cottage or eat at the bistro at least one day before arrival. On completion of your booking you will be sent an SMS with the gate code (which changes weekly). Please note that the farm office and facilities are closed on Sundays. Once through the gate you will be on gravel for the rest of the pass, so it's perhaps wise to lower your tyre pressures by 20% otherwise you will be in for a bumpy ride. The road winds its way gently into the south-west ascending very gently with the vineyards keeping you company on the right. The scenery is lovely and gets better as progress is made up the kloof. Along this gravel section, you will get your first close up glimpses of the irrigation pipes, which you will be seeing a lot more of for the next 20 km. At the 3 km mark, the road kisses the banks of the Holsloot River for the first time and changes direction abruptly into the south. The next 3 km sees the kloof progressively narrowing with the mountains closing in on the left and the valley narrowing. There are a number of twists and turns along this section, but the road is generally quite wide and passing vehicles from the opposite direction is not a problem. The road rises and falls continuously as distance is gained, but be particularly careful of a very sharp bend at the 6,5 km mark. It's a 90 degree left hander and drops sharply at the same time. The drops off on the right are steep and unguarded so drive with caution. 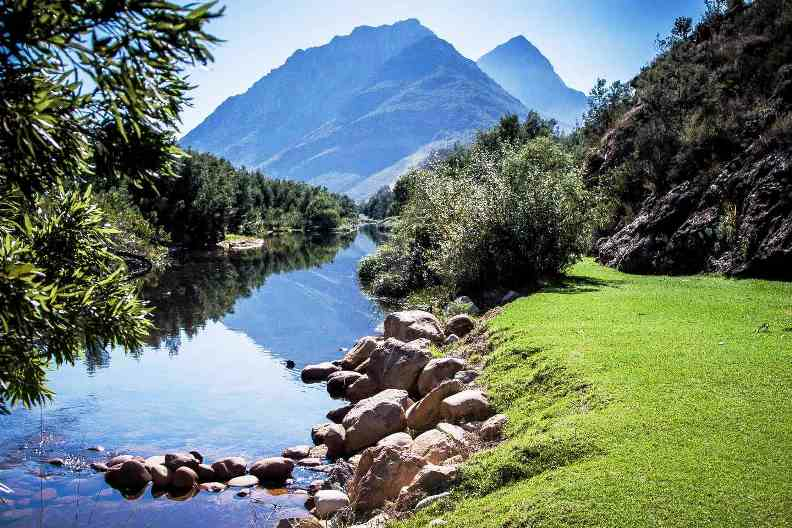 This bend also reveals the beautiful gardens and lawns of the Dwarsberg Trout Hideaway spread out in front of you. This is followed by a short, steep descent and a right hand bend over a small bridge and you have arrived at the main office complex, bistro and shop. Park on the left under shady trees and complete the formalities. Dwarsberg is a more modern name as the original farm was called Elandsfontein 512. Just to the eastern side of Dwarsberg is a cluster of houses with the bizarre (and humorous) name of Tjops & Change. The farm is well watered - not only by the swiftly flowing and perennial Holsloot River, but by five smaller streams that cascade down the Dwarsberg Mountains from the eastern side. The biggest of these is the northerly one named Waterkloof, followed in succession by Draaikloof, Tierkloof, Frontkraal se Kloof and Waboomskraal se Kloof. These smaller streams generally only flow during the wetter winter months. The office building has a small shop where basics can be purchased, as a well as bistro set under shady vines with indoor and outdoor seating. The farm is perhaps best known for its quality camping. There are (at this stage) 11 campsites. Each of these is set far apart from the other and each has its own private ablution facilities. At the time of writing (Feb 2019) only three (sites 4,5 and 10) were not electrified. All the campsites are beautifully grassed with shady trees and level sites very close to the river. We would rate this as one of the top 10 campsites in the Western Cape. The rates are unusual in that group camping is encouraged, rather than individual camping. One pays for a minimum of 6 people (even if you are only 2), so to make it feasible economically, it's best to organise some friends. The venue is popular and bookings have to be made far in advance (especially in the summer season). There are also 4 cottages available to rent. The main activities are bird watching, hiking, mountain biking and trout fishing. Please note that Dwarsberg Trout Hideaway has a no pet policy in place. There are four cottages to rent - each sleeping between 4 and 7 people. The cottages are all named after people associated with the farm. One of the cottages Tant Sarie was named after Sarie Viljoen, who sold the farm to the Stoffbergs on 1975. Another is named Tant Kappie after a resident on the farm in early 1900's who insisted on walking the 15 km to Rawsonville; her fair skin protected by a bonnet (kappie). Beyond the farm, the more technical part of the drive commences and the observant driver will notice the progressive narrowing of the road. There are plenty of bends and corners along this road - 128 of them in total and 10 of those have turning arcs of greater than 90 degrees. There is a blanket speed limit of 40 kph which is best complied with in the interests of your own safety. There a number of spots along this road where the drop offs on the right are extremely steep and there are no guard rails whatsoever. On some of the sharper right hand bends, it's very easy to make a mistake and put a wheel over the edge if you're gawping at the scenery instead of paying attention to the road. So be extra careful. As progress is made along the kloof, the road gets increasingly narrow, but there are more than enough small widenings to allow safe passing (not overtaking!) providing that both vehicles carefully move to their respective left hand sides. At the 9,7 km mark if you look up to your left you will see another deeply incised ravine. This is the Drosterskloof (Deserters Ravine) which must hide an interesting snippet of history. At about this point, the Dwarsberg mountain has a name change and the new mountain on the left bears the name of Kweekkraalberg. It's highest peak which is clearly visible from the road, is 1400.7m high. On the opposite side of the river, where the river forms some beautiful rock pools and where one of the lovely campsites has been located, bears the name Drostersgat - undoubtedly so named as this must have been where those who deserted their military posts used this as a watering and bathing point. 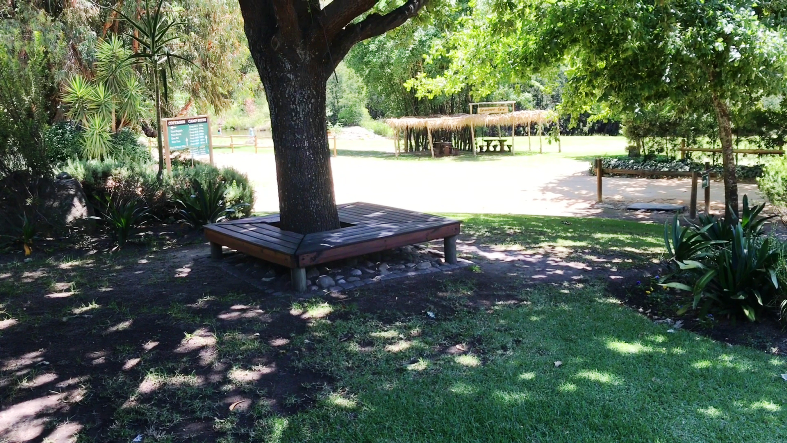 This lovely spot is supplemented with water from a ravine on the western side of the kloof known as Bynekranskloof. At this point the road crosses the official border of the Dwarsberg farm and enters the land marked as the Haweqwas State Forest. Soon a second deeply incised ravine can be seen on the right, which is the Muiskondkloof. During the hot summer months, these appear as scars down the face of the kloof with little or no water present. 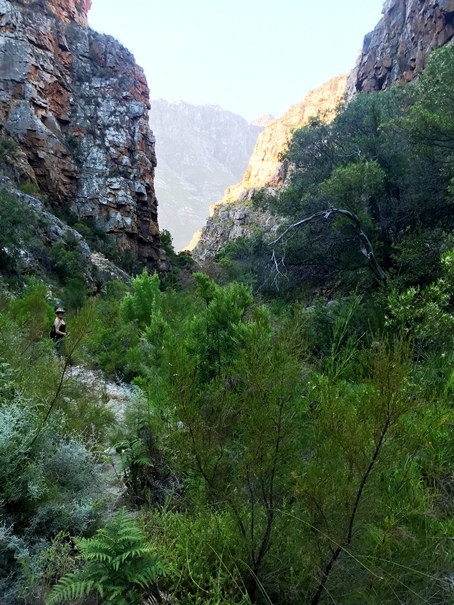 At the 10 km mark, there is a distinct change in topography as the kloof narrows perceptibly and the routing of the road becomes more convoluted with many changes in altitude. Although for many the ever present twin irrigation pipes might seem a bit 'in your face', rather consider the complex engineering that has gone into the scheme and note the many changes in altitude as the pipelines have been built to cope with the changes in gradient and the many pressure release vents are visible along the length of the pipeline. Sometimes it's on the left; sometimes above the road; sometimes on the right; sometimes below the road and even under it. The bridges are all in excellent condition and built out of solid concrete to high engineering standards. In particular the second last, which is also the longest bridge, is worth stopping at and examining. Most people think that Worcester's main dam, the Brandvlei Dam is fed by the Breede River, but the truth is that the Breede River is actually lower in altitude than the Brandvlei Dam. 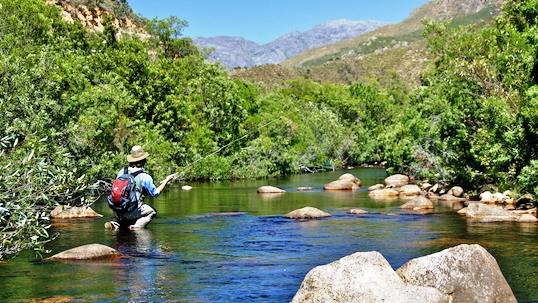 The Holsloot River and the next river to the north-west - the smaller Smalblaarrivier - both form a confluence just north-east of Rawsonville, then flow into the Breede River. Well they used to pre-1955. As part of the Breedekloof Irrigation Scheme, the two rivers were blocked off just after their confluence and a canal was built that takes the water through a sharp right hand bend via a deep canal directly into the east and under the tarred R43 to flow into the Brandvlei Dam. If you study the inflows to this big dam, it soon becomes obvious that the canal is the primary water source that feeds the dam. Another point of interest is that the dam a little further to the south-east of Brandvlei (near the maximum security prison) is known as the Kwaggaskloof Dam and is separated by a thin earthen wall from the Brandvlei Dam. The whole irrigation scheme was cleverly conceived and a great success, with perhaps its biggest downfall being that it has a big surface area and is not very deep, which makes it prone to evaporation. A gravity fed canal system flows from the north at a weir in the Breede River for almost 8 km and joins another canal at the Kwaggaskloof outlet to form a much longer canal that irrigates farms to the south-east which is almost 20 km in length. The entire system forms part of the Breedekloof Irrigation Scheme and has contributed enormously to the success of the region as a productive farming zone. 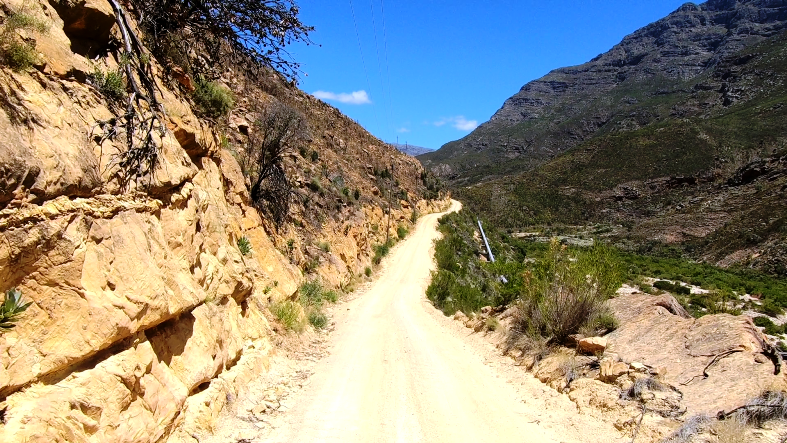 As you approach the 13 km mark, the mountains get ever steeper and the routing of the road becomes more challenging. This big left hand bend is known as Afsaal (a place to dismount from your horse and stop for a water break - in the old days). There are deep ravines scoured out of the mountains on both sides of the kloof. To your left is Fynboskloof and on the far side is the Afsaalplekkloof. Just a little further at the 14,7 km mark, there is a sharp S-bend which drops down quickly into an attractive side ravine. There's a small bridge here and below it is a good swimming spot. There's ample parking for about 6 cars on the left. The spot is known as Hartmansgat and the ravine seen disappearing up into the mountains on the left is of course Hartmanskloof. If you have an hour and a half spare, take a walk up the ravine for about 40 minutes, where you will arrive at a spectacularly beautiful waterfall. It flows year round and the water in the stream is perfectly potable, but be warned, this is not a proper footpath, but rather a series of vague tracks, which often split up confusingly into several options. Follow the cairns and you can't really get lost. Watch where you put your feet as there are hundreds of slippery rocks and places where you can injure yourself (and especially if your shoes get wet from the many river crossings). 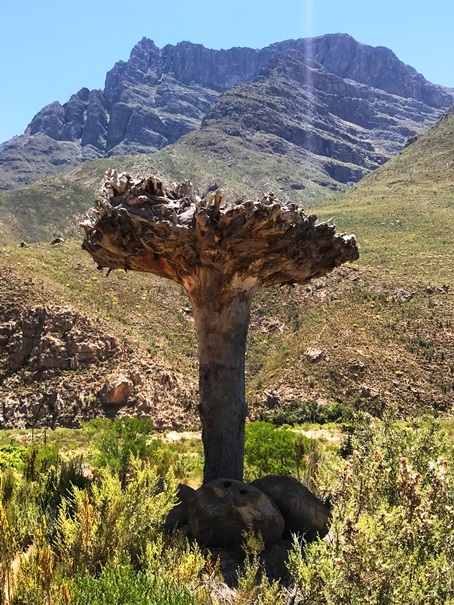 Stettynskloof has another mysterious story - it was the scene where an SAAF Avro Shackleton crashed on Thursday, 8th August 1963 at 15h25 in stormy winter weather. The tactical submarine phase of Operation CAPEX (Cape Exercise), a joint training exercise involving elements of Britain's Royal Navy and both the SA Navy and Air Force, commenced on August 7, 1963. During this phase, the Royal Navy submarine, HMS Alliance, would relocate from her existing position south of Port Elizabeth to a position further west, from where she would take part in further exercises with the SA Navy. During this transitional phase of the submarine, Shackleton 1718 was tasked by Maritime Group to conduct a CAPEX A exercise with the submarine. Although 35 Squadron was based at the military section of DF Malan International Airport in Cape Town, the unit's headquarters was at nearby Air Force Station (AFS) Ysterplaat and it was at this latter facility that the flight crew of Shackleton 1718 received a full briefing at 12H30 on August 8, 1963. 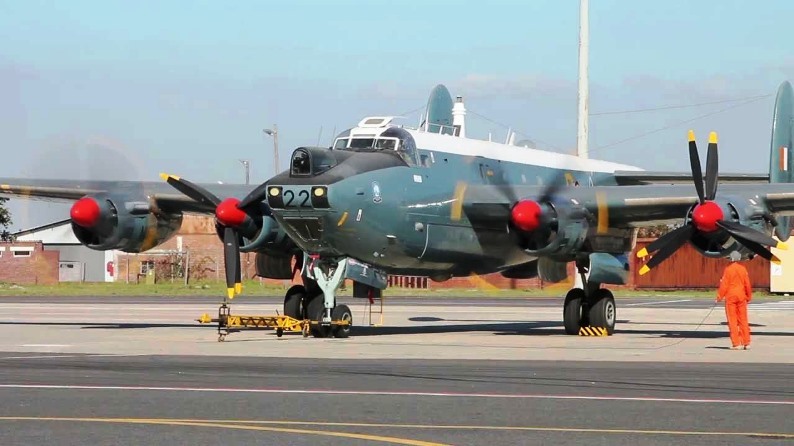 During this briefing, the Operations Officer on duty advised the Shackleton aircrew to head out over False Bay after takeoff and to transit seawards towards the exercise area. He warned them that the direct overland route to Port Elizabeth should be avoided due to anticipated high icing levels on this route. Even though the forecast weather over the eastern overland route was no better, at least the seaward route would eliminate the risk of the aircraft accidentally flying into high ground in the conditions of much reduced visibility. The aircraft commander, captain (Capt) TH Sivertsen , when giving his own briefing, confirmed his route as south over False Bay and then seawards towards the exercise area. 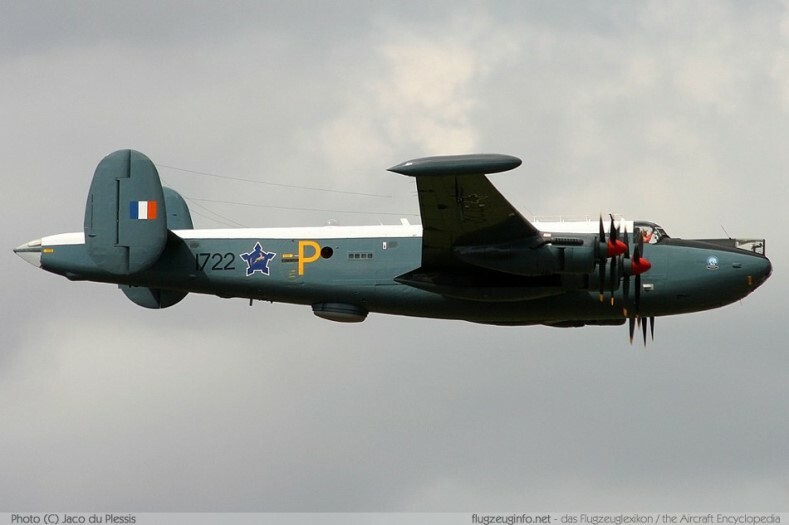 The flight had been authorised by Maritime Group to provide the Shackleton crew with training in the radar detection of a submarine. No special instructions were issued. The Flight Office at Ysterplaat was uncomfortable about the weather conditions and telephoned the Maritime Group Operations Centre thrice prior to the departure of the Shackleton, in an effort to get the flight cancelled, but this request was not forthcoming. Just minutes before takeoff, Capt Sivertsen, notwithstanding his briefing instructions, informed Air Traffic Control (ATC) that he would climb to 2 896 m AMSL and head overland towards Port Elizabeth. The aircraft lifted off Runway 34 at 15H06 and turned right on 350° for the climb out. Moments later, ATC informed the commander to come to 330° so as to safely avoid Tygerberg. Capt Sivertsen acknowledged this transmission and did accordingly. After the lapse of about a minute, he requested clearance to resume his original course of 350°. This was the last radio transmission received from Shackleton 1718. The wreck was finally discovered from the air at 17h18 just over two days following the accident. It was evident from the almost complete destruction of the aircraft that nobody aboard could possibly have survived the crash. The crash occurred about 25.8 km from the nearest town, Worcester, in the Stettynskloof valley between Paarl and Stellenbosch. After inspecting the crash scene, the 35 Squadron Engineering Officer, Capt WJ Stiglingh decided to investigate the failures apparent on the port elevator and the upper section of the starboard rudder, both of which detached in flight. The section of the starboard rudder was found 1 620 m and the port elevator 1 250 m from the impact point. Following the disintegration of these two flight control surfaces, the aircraft would have been rendered uncontrollable. At this point (about 15H25) the pilot was heard to make his final radio transmission: “Mayday. Mayday,” but this was not recognised as such by the ATC. The timing of the transmission coincides exactly with the crash time. The Board established that the impact speed of the aircraft was high and that this, combined with the resulting fire following the crash, caused the almost complete destruction of the aircraft. There was no attempt by the crew to use parachutes and all 13 aboard are assumed to have perished in the high G impact. The Board established that the atrocious weather was a significant contributory factor in this accident. Wind speed was about 148 km/h. The Board found Capt Sivertsen solely responsible for the accident. He displayed a complete lack of discipline by disobeying a direct order to rather route south over False Bay and instead routed over land, where the mountainous terrain exacerbated the already foul weather conditions. The aerodynamic effect of heavy icing, strong and turbulent winds, the heavy weight of the aircraft combined with the possible over control by the pilot in control, placed an unusually high loading on the airframe. This resulted in the airframe exceeding its design limits and initiated disintegration, leading to the loss of control and the consequent fatal crash. The accident was classed as an avoidable major flying accident. But there is another twist to this story. 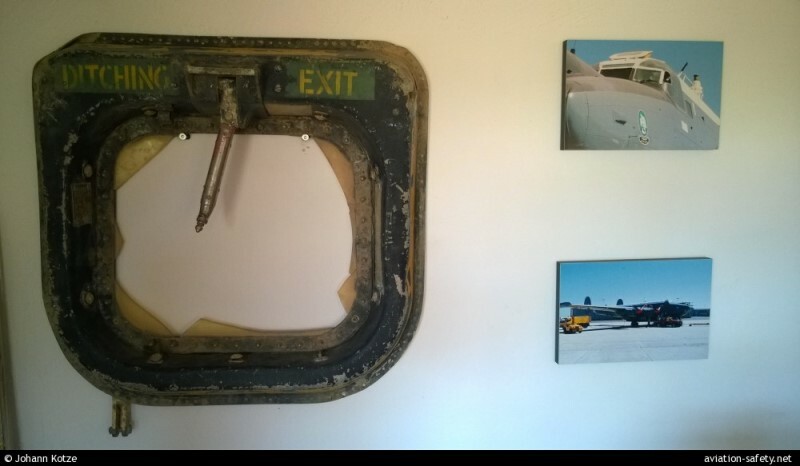 A rectangular metal window aircraft marked with the words DITCHING EXIT was found 60 km away on the farm Honingklip between Hermanus and Botrivier. The serial number and date match up with Shackleton 1718. 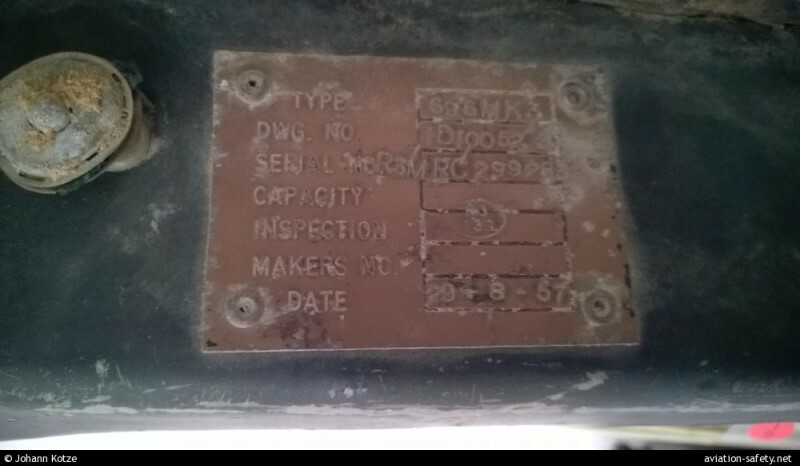 So how did this piece of the aircraft end up in Botrivier some 60 km away from the crash site? Further information supplied by the photographer Johann Kotze and reproduced here with his permission. Cobus Brink sent us the initial information on this section - with thanks! From this point the road drops steadily down towards the main bridge over the Holsloot River. The mountains on the left have their third name change - this time to the Stettynsberge. Note that the main bridge crossing is a single width bridge. From the bridge you will see the earthen wall of the Stettyn Dam. After clearing the big bridge, the road bends sharply to the left then traverses the grounds of the maintenance staff homes that take care of the dam. Proceed dead slow through the small settlement. The road appears to terminate at two bigger houses, but if you look to the right of the lower house on the left, you will see a concrete driveway that appears to go behind the house. This is the actual road which you must take. Once again drive dead slow and keep your noise levels down. Once past the house, the road becomes gravel again and passes through an attractive garden. There's a storm water canal and a set of gabions flanking the road here. After 200m there is another much smaller bridge. Once again it's single width. Once over the bridge, the gradient suddenly picks up and at the 17,4 km mark, the road climbs steeply at 1:6 through a 160 degree hairpin. This bend is generally rutted and corrugated and can easily cause a loss of traction. If you're in a 4x2 vehicle and you have a diff-lock, we suggest you engage it for this short section. We do not recommend that normal cars tackle this final section. Rather park at the little settlement and walk the last 2 km to the dam wall. Once over the last steep climb, the road bends to the right and this is where the summit of the pass is reached at the 17,8 km point of 512m ASL. The inky blue waters of the dam come into view and all that remains is a short, steep descent, followed by a 45 degree left hand turn onto the dam wall itself. You can drive to the very end of the wall (the roadway is wide and flat here) and stop and walk on the elevated concrete walkway to get a look at the spillway which must be a wonderful site when the dam is overflowing. A steel latticed walkway about a third of the length along the wall leads to an intake tower, which is out of bounds to visitors. Please respect the signs and comply, lest we lose access to this wonderful drive. 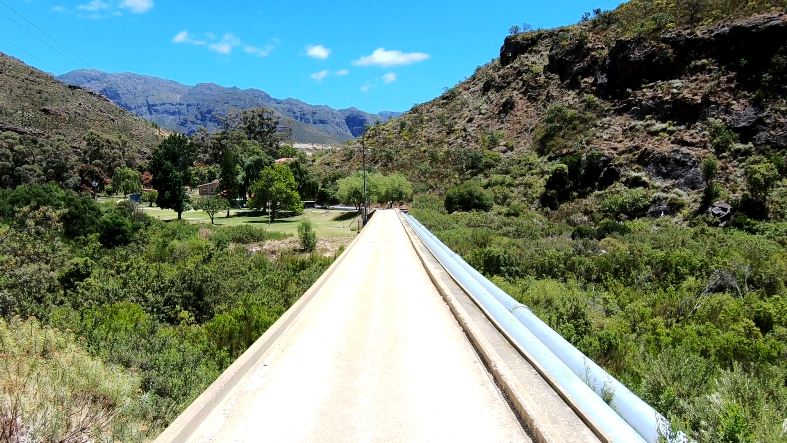 The dam is a combined earth-fill/rock-fill type dam and was constructed in the period 1953 to 1955 and was part of the Stettynskloof Irrigation Scheme, which includes much more than just the construction of the dam and spillway infrastructure. The dam has a storage capacity of 14,7m cu.m. To put that into perspective the nearby Brandvlei dam has a capacity of 286m cu.m. The project included all the bridges, the access roads, the pipelines and the diversion canal to take the water to the Brandvlei Dam some 30 km away. The dam was officially inaugurated on 25th August, 1955 by the then Minister of Lands and irrigation Paul Sauer. He also had the bridge over the Storms River gorge in the Tsitsikamma area named after him. Consulting engineers were Ninham Shand. Considering the project is now 64 years old, the works look like they have only recently been completed, which bears testimony to the quality of the original engineering work. Modern history of Stettyn started in 1719 when the original farm on the eastern side of the mountain was granted to free-burghers Cloete and Radyn, whom had ancestral links with Stettin in former Prussia. The official government maps still record the original name spelt at Stettin. When you are standing on the dam wall, you will notice that the dam is formed by a trio of huge ravines. The streams that flow down these three ravines flow in from the south, west and north-west. The valley to the north-west is the upper part of Stettynskloof. The dam is surrounded by three mountain ranges too. Stettynsberg is to the south, Wemmershoekberge to the west and the DuToitsberge range to the north. Most of the bigger peaks in these ranges vary between 1400m and 1800m in height. It's a wild, rugged and impressive vista. Once you have finished your visit, you have to retrace the entire route back to the start. Allow a full day for this excursion and try and include a picnic, some fly fishing, a hike or a mountain bike ride. It will be a day well spent. Don't drive this route if you're short of time. Narrow road with steep unguarded drop offs. Avoid the final two kilometres if you are not in a 4x4 or at least a 4x2 with diff-lock. No access without booking in advance.